Burlington, NC – Col. Roy W. Douglass, Commander, North Carolina Wing was notified by Maj. Gen Amy Courter, National Commander, Civil Air Patrol, that the North Carolina Wing was selected to receive one of the highest awards presented by her office. “Congratulations! I am happy to inform you that the North Carolina Wing has been selected as the winner of the Paul W. Turner Safety Award. Your wing was selected based upon their outstanding success in the safety program,” Courter said. The Paul W. Turner Safety Award—an annual award presented to the CAP wing with the most outstanding safety program and safety record. The award consists of a plaque and includes the wing's name being placed on the CAP safety scroll at National Headquarters. Each region commander may submit one nomination for the previous calendar year to National HQs/CAP. The award will be presented to the wing commander at the annual National Conference. This is the second time in just two years that the NC Wing has been granted the award. 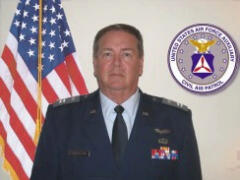 The 2007 Turner Award was presented to former NC Wing Commander, Col. Larry J. Ragland, at the National Convention in Atlanta. The newest award will be presented to Douglass at the National Convention in San Antonio, TX in September. Douglass credited Capt. John D. (Dan) McCollum, NC Wing Safety Officer, for creating a safety program that instilled a “safety consciousness” throughout the wing. “Capt. Dan is relentless in his quest for perfection, and he has come as close to it as one can come,” Douglass said. The Safety Officer of the Year Award—an annual award presented to the safety officer who has contributed most to the CAP safety program. Each wing may submit a nomination to region. The region commander will review all nominations submitted and will select one nominee believed to be the most deserving of the award. The region commander will forward the nomination to National HQ for final selection. “I am overwhelmed by the honors bestowed on the NC Wing,” Douglass said. “The Turner Award and Safety Officer of the Year Award speaks well of the safety attitude that Capt. McCollum has developed throughout the CAP membership in North Carolina.” McCollum will receive his award in San Antonio also. Douglass listed some of McCollum’s awards and accomplishments: Meritorious Service Award, Commander’s Commendation (2), Disaster Relief Ribbon with V Device, Yeager Award, CAP Membership Ribbon, Leadership Ribbon with bronze star, Garber Award, Encampment Ribbon with bronze clasp, CAP Safety Badge, CAP Mission Observer, CAP Transport Mission Pilot and Cadet “O” Pilot. McCollum joined CAP in 2002.